Trailer for upcoming Hong Kong Film "Mon Mon Mon Monsters"
A target of bullying, a gifted student reluctantly joins a rancorous gang of three for a community care assignment, which ends up with a surprise catch of a man-eating little monster. Driven by curiosity, they begin a series of weird research on it as their relationship goes through an intricate change. 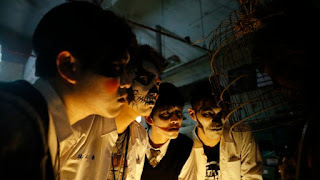 Asian Film Vault: Trailer for upcoming Hong Kong Film "Mon Mon Mon Monsters"